First time we found Wat Sri Sunthorn was back in 2006. I had one of those days when I wanted to explore temples and we set out with a particular target in mind. Phuket is full of temples, and there are still a few that we have never visited. In particular on that day wanted to find Wat Phra Thong, where there is a famous half buried Buddha image... We found it, and it was duly blogged, but on the way, to the south of Thalang Town (which used to the the main town in Phuket a couple of hundred years ago) we also found Wat Sri Sunthorn and were very glad we did. I have been back several times since. It has never been crowded. The temple is named after one of the two sisters, known as the Heroines of Thalang - Thao Thep Kasattri and Thao Sri Sunthorn who rallied the people of Phuket to fend off invading Burmese in 1785. Actually at the time, their names were Chan and Mook. Chan was the widow of the recently deceased governor, so she and her sister took charge of Phuket's defences. Later King Rama I gave them these honorary names. The main road up to the airport where this temple is located is called Thep Kasattri road. There were several buildings in the temple ground and lots of statues. The main Wat has been closed on the occasions I have visited, but on top of another building is a huge reclining Buddha which can be seen from the road as you drive past. The entrance to the temple has recently been widened - it used to be visible only down a narrow track through the trees. There are steps up to the roof around the right side of the building. Anyone visiting should remove shoes before going up - and on a hot day the roof can be quite hot! On our most recent visit in May 2015, we noticed a few changes such as a shop in the temple grounds selling drinks, snacks and Buddhist trinkets. I think the widening of the entrance was part of a plan to get a few more visitors in, but in general this area of Phuket, far from the beach, is not very touristy. (above) My boy and the Buddha a few years ago. Glad that my kids don't mind being dragged around to see a few temples now and then! 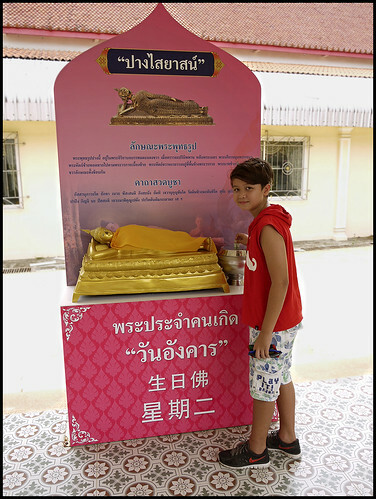 The urge does not grab me that often, but I got it again recently and so me and the boy drove up towards Thailand, also stopping to visit Wat Phra Tong and also Wat Phra Nang Sang, which is in the middle of Thalang Town. We left a donation - there are donation boxes for each day of the week, each with a small Buddha image representing that day of the week. Each day has the Buddha in a different pose. It happens that my son and I were both born on Tuesday. The Buddha for Tuesday is the reclining Buddha, just like on the roof. Wat Sri Sunthorn is easy enough to find, not far north of the Heroines Monument - a shrine and statue in the center of a traffic circle on the main road between Phuket Town and the airport, to the south of Thalang Town. Worth a quick stop if you are passing for sure!